Stocks Unleashed: Insas (RM0.87): Still stuck while Inari flies to the sky? Insas (RM0.87): Still stuck while Inari flies to the sky? Just look at the chart above. Inari was bashed down from RM3.10 level (adjusted) to below RM2.10++ in last Oct and December. At the same time, Insas was down to 80 sen from RM1.25 level. Nonetheless, since then, Inari climbed to all-time high of above RM3.30 while Insas was hardly up by comparison. At the same time, Insas' NAV continued to go up to RM1.82 now. Why the dichotomy? Holding company discount? Insas not doing anything for shareholders (No dividend policy, meager dividends)? Value trap (It acts like Thong's own sole-proprietorship)? Unstable earnings (A lot of liquid investments such as bonds and equities which have changing market values all the time)? Insas' 27.7% share in Inari mother share is worth RM650mil already and we have not included Inari warrants which could be at least RM20-30mil. Both of these holdings are already 10% more than Insas' own current market cap. This means the rest of Insas' assets are totally free, including Insas' financial investments (Bonds, equities etc) and net cash total about RM500mil, associate companies worth RM160mil and RM160mil worth of investment properties. The immediate catalyst I see is probably disposal of Inari to realize gains from its Inari holdings. 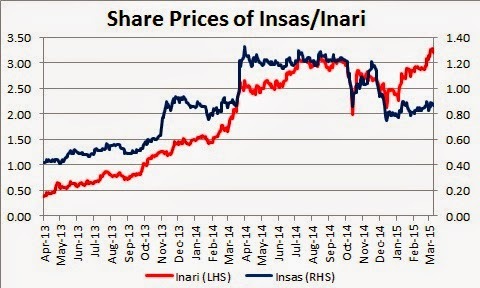 Recently Insas disposed 3.2mil++ shares in Inari. Hopefully more to come. Koon Yew Yin also blogged about it last year. Will Insas do more going forward? We'll just have to ask Dato' Thong. Enter if you have patience to wait for Insas' price to catch up. For now, I see tremendous value that can be unlocked from Insas. However, its price will remain depressed as long as the major shareholder has no intention to unlock value at all. Will Dato' Thong do it? Why should he? When?